This article appears in the February 4, 2015 issue of AICR’s CRU. To mark National Cancer Prevention Month, AICR has launched a nationwide campaign, public service announcement and website, offering evidence-based information and practical tools for lowering cancer risk. The awareness campaign Cancer Prevention- Together We Can highlights the healthy changes shown to lower cancer risk. The campaign's new PSA features colorful, dynamic text-based animation to educate viewers about the links between everyday choices and cancer risk, linking to AICR’s CAN PREVENT website. There, users can download a 30-day cancer prevention planner, use an interactive tool on factors that lower risk for specific cancers, and find tips and activities that lower cancer risk. All content is evidence-based and uses AICR's expert report and its continuous update project reports. AICR estimates that fully 1/3 of the most common cancers in the US could be prevented if Americans moved more, weighed less and ate more healthfully. That’s about 338,000 cancers every year that never have to happen. Add in not smoking and avoiding sun damage, and that figure climbs even higher – nearly half of US cancers could be prevented by changing our everyday habits. 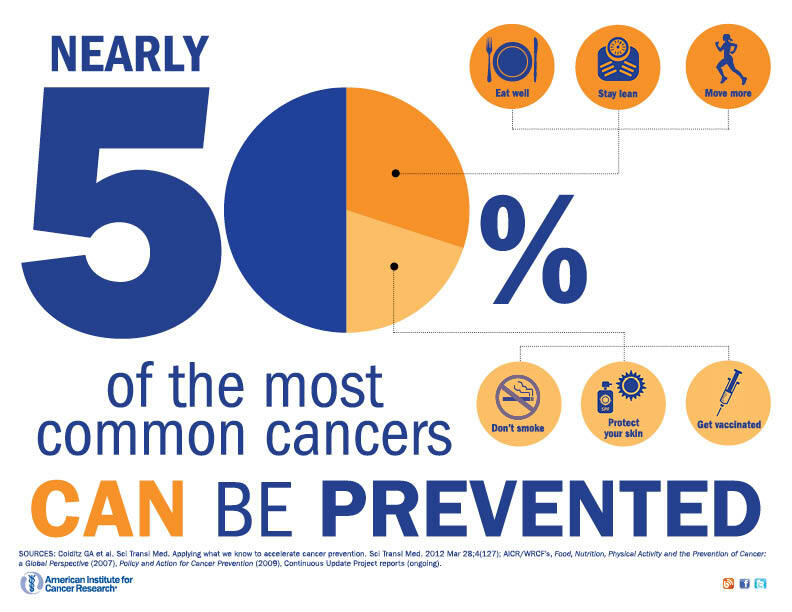 Throughout this month, AICR is sharing the cancer-prevention tools and strategies through social media using the #prevent50 hashtag. The site offers shareable infographics and videos, and we encourage everyone to help spread the messages on cancer prevention. Join AICR on Facebook, Twitter and Instagram. On instagram, use the #pictureprevention hashtag. This article appears in the February 4, 2015 issue of AICR’s CRU. Sign up now to receive the latest on the diet-cancer link.